Jesus loves me this I know. I’ve always wanted the lightning strike, the booming thunder-voice to reverberate across my confusion and direct me in the way I should go. I’ve begged for God to yell, to force my path, to throw a boulder to block me into safety. For the Bible tells me so. I’ve prayed for guidance on huge decisions and gotten the still, small voice that that was promised. Little ones to Him belong. I didn’t want the still smallness. I wanted the giant kaboom. The giant crushing feel of His arms around me. They are weak but He is strong. 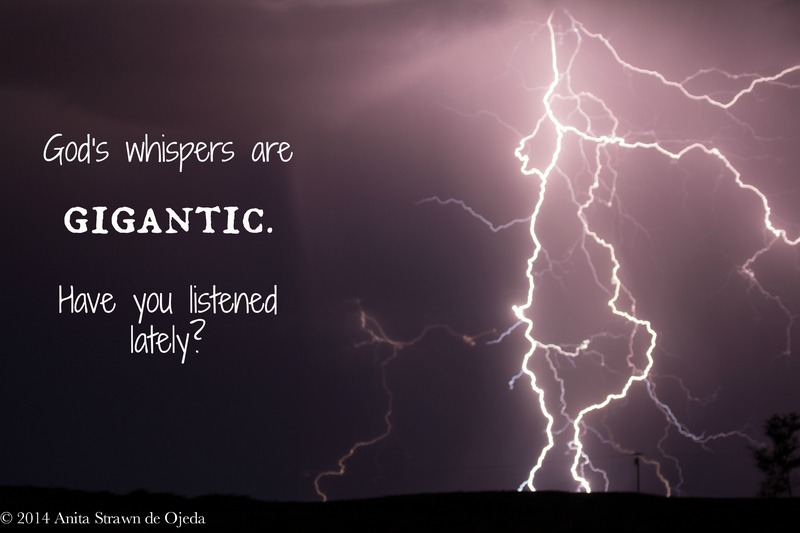 In the midst of my biggest sorrows and times of need, I get the whisper. Yes Jesus loves me. At times I’ve been frustrated; I’ve lived my life under God’s guidance, why is He still whispering? Yes, Jesus loves me. But in those quiet God moments, where love and promises filter through my troubled soul, I can look back over my own little personal history and see that God’s whispers have been gigantic. Yes Jesus Loves me. The little whispers through my life have comforted, celebrated, encouraged and even directed. The Bible tells me so. I believe I’m right where God wants me to be, doing what I should be doing, becoming who I need to become. A gentle loving whisper.